Have everything you need to explore upon landing by booking private airport transfers and airport luggage services! Connect with family and friends and tell them all about the exciting vacation you are having in Thailand without exorbitant roaming costs all thanks to an unlimited data 4G Thai SIM card. Enjoy lightning fast web speeds, get updates from your social media accounts and make hassle-free travel arrangements. 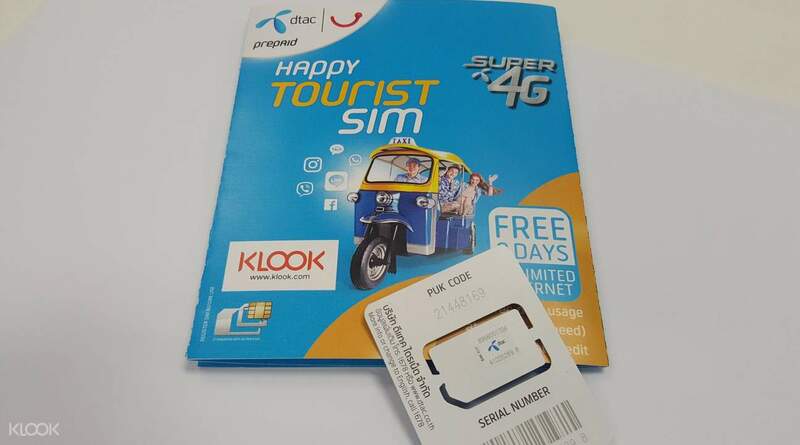 Available for pick up right when you arrive at BKK, DMK airports, or from the Siam Center in the city, the Thailand SIM card will let you connect to the 4G network (depending on the area) and will let you make the best of your vacation without worrying about the details. it was overall good experience at klook counter at Suvarnabhumi airport. it was located at level B near airport link metro station. The staffs were very quick to deliver the SIM cards. I bought 2 cards, one for me & another for my wife. We got it placed in our phone right there at the klook counter and the data access started working immediately and it helped us to do other important things via data access. overall service was very good. it was overall good experience at klook counter at Suvarnabhumi airport. it was located at level B near airport link metro station. The staffs were very quick to deliver the SIM cards. I bought 2 cards, one for me & another for my wife. We got it placed in our phone right there at the klook counter and the data access started working immediately and it helped us to do other important things via data access. overall service was very good. I bought two SIM card and collected at BKK airport, the pick up counter was easily to found which next to the ARL station at the B/F and just show your order number to the staff and get your SIM card easily. The staff will help you to change the new SIM card, so that you don’t need to worry about where can found a paper clip. The network was stable and fast. This is the cheapest SIM card that I can found in THAILAND. I bought two SIM card and collected at BKK airport, the pick up counter was easily to found which next to the ARL station at the B/F and just show your order number to the staff and get your SIM card easily. The staff will help you to change the new SIM card, so that you don’t need to worry about where can found a paper clip. The network was stable and fast. This is the cheapest SIM card that I can found in THAILAND. Redemption was easy, just outside DMK arrival gate. The staff put the sim in my phone and activated it. Connection was stable and strong even in the subway trains, so it's easy to navigate around the city. Redemption was easy, just outside DMK arrival gate. The staff put the sim in my phone and activated it. Connection was stable and strong even in the subway trains, so it's easy to navigate around the city. Thank you so much klook for awesome sim card for 6days no hustle moments big help and connection was so good 👍. Klook never failed me every time i purchased any item with them. Smooth transactions like before location near bus station the staff are so friendly. Till next time klook and more power 🤘. 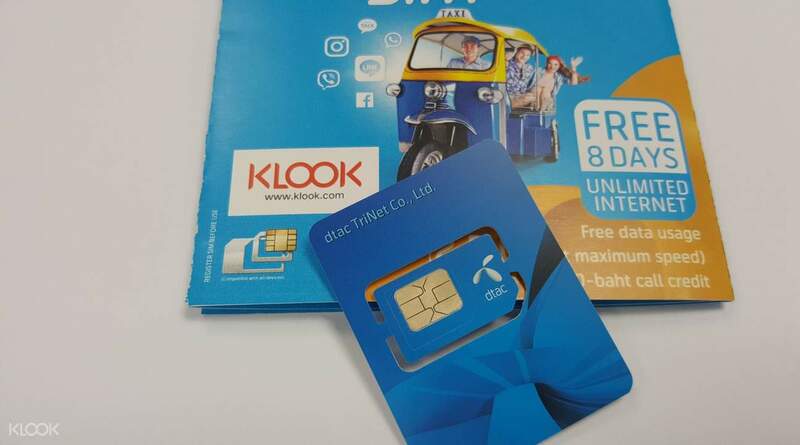 Thank you so much klook for awesome sim card for 6days no hustle moments big help and connection was so good 👍. Klook never failed me every time i purchased any item with them. Smooth transactions like before location near bus station the staff are so friendly. Till next time klook and more power 🤘. Great alternative to buying a SIM card upon arrival. No ques, no hussle and bussle - just after immigration - your SIM awaits :) Good thing about getting Klook card in DMK - they work 24 hours a day. We arrived 23:20 and picked up our SIM at 00:30 without any problem. By the way, besides included internet traffic, there is 100 baht on your balance which is more than enough for a few days in BKK. And the main good thing about this activity - its really cheaper than buying upon arrival - at least twice cheaper based on my experience. Highly recommended! Great alternative to buying a SIM card upon arrival. No ques, no hussle and bussle - just after immigration - your SIM awaits :) Good thing about getting Klook card in DMK - they work 24 hours a day. We arrived 23:20 and picked up our SIM at 00:30 without any problem. By the way, besides included internet traffic, there is 100 baht on your balance which is more than enough for a few days in BKK. And the main good thing about this activity - its really cheaper than buying upon arrival - at least twice cheaper based on my experience. Highly recommended! We had a great time at ayutthaya. AK tours did an amazing job accompanying us and giving us a comprehensive historical summary of all the temples and places we had visited. Roger, the guide from AK tours is very good in communicating with us. His words and instructions are clear and easy to understand. We really enjoyed our travel with AK tours and klook, it made our travel and stay in Thailand a memorable one, smooth, hassle-free and worthy. Thank you! Will definitely book again with Klook for my next trip. We had a great time at ayutthaya. AK tours did an amazing job accompanying us and giving us a comprehensive historical summary of all the temples and places we had visited. Roger, the guide from AK tours is very good in communicating with us. His words and instructions are clear and easy to understand. We really enjoyed our travel with AK tours and klook, it made our travel and stay in Thailand a memorable one, smooth, hassle-free and worthy. Thank you! Will definitely book again with Klook for my next trip. Very easy to redeem. Just go to Airport Rail Link and next to main entrance you will see the Klook booth and just give your booking coupon, and that’s all. This DTAC Sim Card is a very great one. The signal is stable. They even give us 100Baht credit to make call. You can also check your card information online at their website and top up your card it in every convenience store. DTAC also gave us promo code for new Grab user. Very good! Satisfied with Klook service. Very easy to redeem. Just go to Airport Rail Link and next to main entrance you will see the Klook booth and just give your booking coupon, and that’s all. This DTAC Sim Card is a very great one. The signal is stable. They even give us 100Baht credit to make call. You can also check your card information online at their website and top up your card it in every convenience store. DTAC also gave us promo code for new Grab user. Very good! Satisfied with Klook service. The 4G Sim Card was absolutely a great help during our stay in Bangkok. We were always in contact with our family and much more made our moving around the city with the fast internet connection to transport services! The 4G Sim Card was absolutely a great help during our stay in Bangkok. We were always in contact with our family and much more made our moving around the city with the fast internet connection to transport services! Q: Can the SIM card be used past the validity period? A: Yes, just go to 7-11, buy the top up card and choose the package you would like. Q: What do I do if the SIM card has no service? A: If you cannot connect to the Internet, please directly call the help number on the SIM card packaging. The contact center can assist you in English or Chinese. If you cannot make a call, you may need to go to a store or a booth for help. Q: Thailand has implemented a SIM card registration policy. Do have to register this SIM card myself?